It is always vital that a wooden clarinet is kept as clean and as healthy as possible. The use of the Conn-Selmer kit enables the performer to maintain the instrument in its perfect glory through use of brushes and cleaning cloths. With this Conn-Selmer Care Kit, everything you need to keep the clarinet pristine is included. A metal polish cloth has been included which prevents scratching to the metal unlike most other cloths. 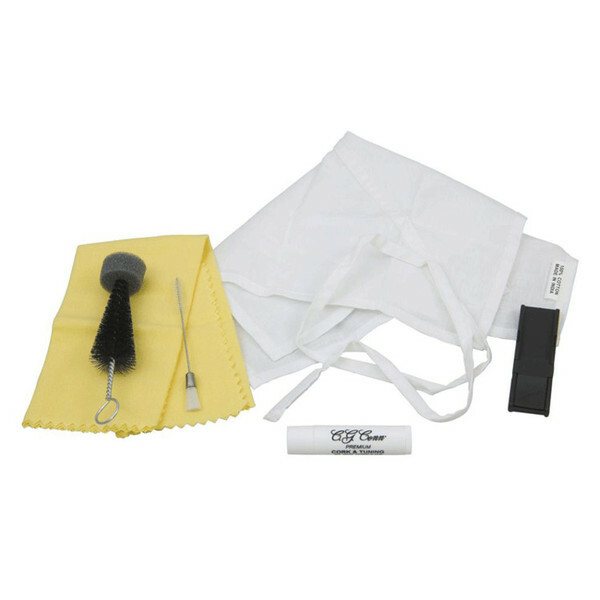 A pull through cloth and flexible clarinet swab aids the cleanliness of the inside of the clarinet, preventing the build-up of grime and dirt. As well as this, a duster brush has been added to remove dust from the hard to reach mechanisms of the instrument. Especially for wooden clarinets, this care kit comes with a set of oils for the keys and for the bore of the instrument which prolongs the standard of the instrument without the wood deteriorating. The oils create an extra layer of protection from moisture and dirt that can over time damage the body of the instrument.